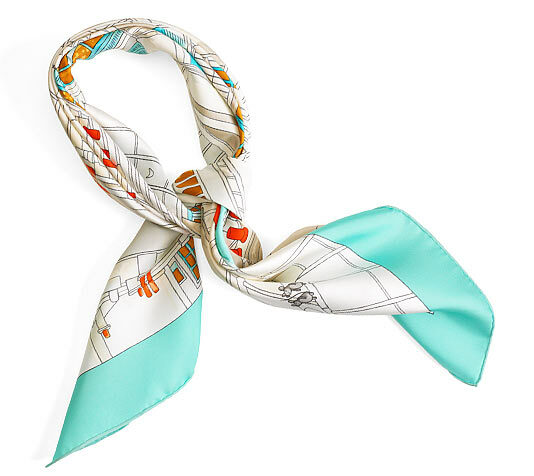 This scarf is an absolute delight to study and discover because it depicts something as uniquely identifiable and as intimate to every city as any recognizable tourist attraction: the skyline, or more appropriately the rooftops. 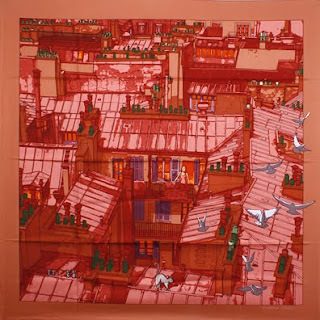 Hermès skillfully depicted "les toits de Paris" ("the rooftops of Paris") with grace, wit and innocent playfulness: the apparent monotony of the rooftops is interrupted by domestic scenes, household lights and even the ubiquitous "friends" that have found comfort in the human beings' existence - birds, cats and even mice. I was somewhat disappointed with the way the scarf displays when knotted, because the playfulness (and the spirit) are lost, but it's nevertheless a scarf I'm very fond of. The﻿ Hermes add, featuring this very scarf, is a beautiful picture of a girl, her hair wrapped inside the scarf, leaning on the window to le her face be carressed by the fairytale snow flakes, and looking out across what we can only anticipate to be the Parisian skyline. "Aux portes du palais" ("At the palace gates") is the fruit of the designer's deep understanding of Indian culture, art and mythology. Each detail, character, animal, plant and architectural element is deliberate and richly symbolic. The large doors signify the threshold between the known and the unknown - two worlds richly depicted in many cultures around the world. Fruit-laden trees bursting with flowers represent Buddha in Indian folk art and symbolize fertility. The lotus flowers - Buddha's flowers - represent spiritual blossoming. The four dancers next to the trees narrate the legends of the gods and stories from everyday life using graceful gestures. 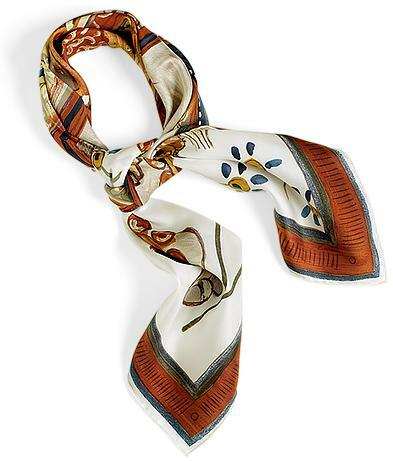 The corners of the scarf depict examples of the protective drawings that women paint on their homes. 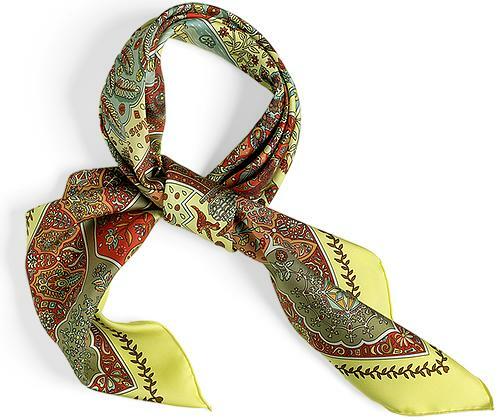 The frieze surrounding the scarf, in the style of Indian miniatures, rich in colourful decorations, is a tribute to the delicacy of Indian art, expressed in fabrics and temple decorations alike. I consider this scarf another fine example of a silk painting, worthy of being framed so as to adorn someone's living room, study or even bedroom. 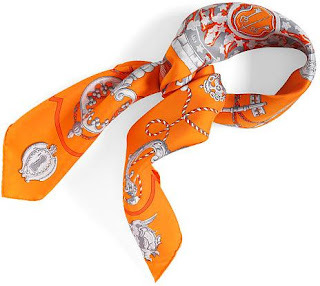 The rich symbolism is thus preserved and the scarf continues to tell a great story, much more than when it's worn. Still today, the tradition of painting elephants with decorative patterns for important celebrations lives on; the animals are adorned in rugs, embroidered ornaments, pompoms and fringes, right up to their richly decorated tusks and right down to their feet, which bear bracelets with small bells. The tradition of painting everyday scenes on walls is still practiced. The designer's simple yet vivid style perfectly captures India's inviting warmth and vivacious character. From the golden key offered to the Governor of the Netherlands by the Members of the Council of State on behalf of King Charles III (in the left corner) to the key to the Notre-Dame Cathedral in Paris (fourth from the lower right corner), the forty-seven keys on this scarf are accurate representations of actual keys. A leather pouch, embroidered with keys from the Musee Hermes, is shown in the middle, while silk cords and pompoms reflect the keys' curls and arabesques. Along the edges of the scarf are illustrations of four-faced "bishop's hat" harness rivets. Each corner depicts a different style of openwork bronze escutcheons. The diversity and complexity of the bits (the wrought part that turns in the lock) makes one wonder which room, piece of furniture or drawer they open, what secrets they were meant to protect with such elegance, refinement and preciosity. They are equally symbolic of the complicated mechanics of the locks. This scarf is a hymn to the craftsmen who chiseled these wonders, as well as to the locksmiths' mathematical genius. 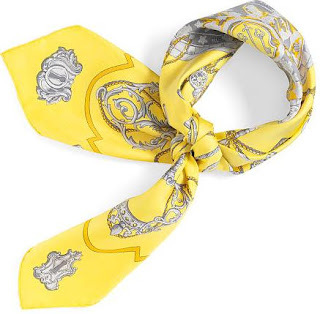 This scarf evokes the age when people hung all their house keys on a chain (or perhaps silk cord) carrying them attached to their belts (I, for one, received the house key, around my neck to ensure a lower chance of losing it, when I started school, in grade one - and I recall vividly how proud I was of the responsibility that I had received, which for me was symbolic of the trust my parents had placed in me). 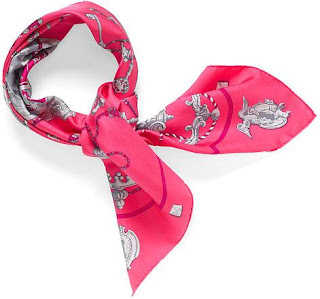 This design was launched in 1965 (hence the "traditional" look of the design) and reissued many times since, the most recent of which was in 2009/2010 in cashmere and silk and in 2010 as a variation on this theme. 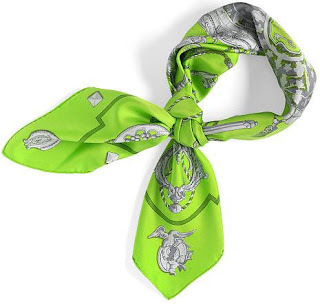 The design endured through the years thanks to Hermes' clever use of colours to instill a contemporary "feel", such as is depicted in the images above and below.